Simple to make, these cookies will be a sure hit with your family, friends, and the big man himself. Click here to PIN these Santa Cookies aka No Bake Coconut Macaroon Cookies! Hey peeps, it’s Cookie Time on the blogosphere. All of us bloggers are mixing up tons of cookies for the holidays. We aim to please. I’m in cookie heaven with these ones. 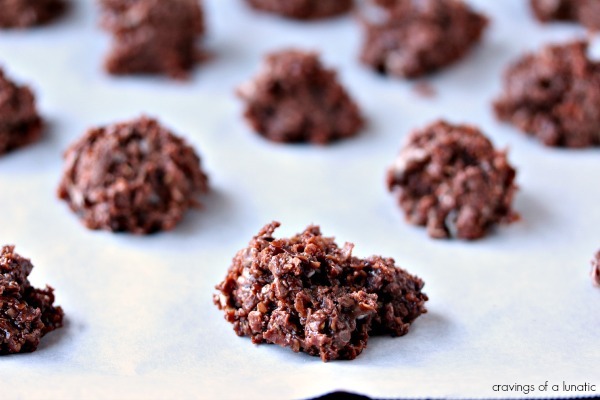 These are no bake coconut macaroon cookies, but they have extra chocolate mixed in them. We call them Santa Cookies around here. We put them out for Santa each year. Santa just loves these cookies. He cannot get enough of them. It’s such a funny coincidence that they just happen to be my favourite cookies too. Isn’t that a coinky-dink? I know right. I’ve been making variations of these cookies forever. I learned how to make them as a teenager. My dad just loved these cookies so it became a tradition for me to make them every year. I’ve kept that tradition going for my own kids. We make coconut macaroons every year. I have other variations of these on the blog. You can find Mike’s Coconut Macaroons that I made way back in when I first started the blog. When I made these cookies for Real Housemoms I decided to make Mike’s variation as well since the old post was missing photos. Then I made another version for a cookie swap a few years ago. Those were called Kim’s Nutella Cookies. They are very similar to these but they use Nutella. They are freaking amazing. We all know Nutella is everything in life. So Nutella Cookies are a dream come true. Recently I made a version with pink coconut, called Pink Coconut Cookies. I know right, super creative with the name on those. Obviously they were pink, which is my favourite colour in the world. I made the pink cookies for Cookie Week. Every week should be cookie week. Now we have these Santa Cookies aka No Bake Coconut Macaroon Cookies. They were originally shared on Real Housemoms. Back in the day when I used to have more time to contribute to other blogs and do things like comb my hair. Then life got super busy. When life gets busy I still fall back to comfort food. Like cookies. Cookies like these Santa Cookies. You’re going to love them. Not only are they easy but with the added chocolates in this recipe they will knock the socks of Santa. And anyone else who munches on them. Line two cookie sheets with parchment. Set aside. In a medium size saucepan cook the granulated sugar, cocoa powder, and milk over medium-low heat until all the sugar dissolves. If it's got a nice bubble going this should take about 3 to 5 minutes, or so. Keep stirring but not obsessively, it just needs a light stir every 30 seconds or so. Once the sugar is dissolved add the butter, don't fret if you didn't soften it. If it's not softened just cut it into small chunks, it'll totally still work. Keep stirring until the butter is melted and the mixture is smooth. Now add the vanilla, oats and salt. Stir until combined, then remove from the heat. Add the coconut, stir again. I know right, it's a lot of stirring. Now toss in the milk chocolate chips and the white chocolate chips. Stir again. Stop rolling your eyes at me. Stirring is good. You are now done stirring. Yah. Round of applause. Take a tablespoon or an ice cream scoop and drop the cookies onto the cookie sheets. It's okay for them to be lop-sided and not perfect. They actually look better if they are imperfect. I also suggest making some really big and some small. Since you are not baking them they don't need to be uniform in size. Making different sized ones is nice, that way wee little hooligans can grab small ones and bigger adult hooligans can grab the bigger ones. Santa can grab any size he wants as long as he leaves good gifts. Allow to cool completely. Good luck with this step. It's impossible not to dig right in. Quite honestly I was eating this right out of the saucepan with an ice cream scoop before I took photos. Just keepin' it real peeps. Just keepin' it real. Serve with a big old jolly Saint Nick smile! Be sure to keep tuning in for more Christmas Recipes. Plus lots of Cookie Recipe options. I’ve got 2 weeks of holiday recipes coming at you starting tomorrow. Twice a day posting for two entire weeks. You’re going to love it. Everything from sweet to savoury, plus everything in between. PIN THESE SANTA COOKIES TO YOUR FAVOURITE DESSERT BOARD! Cookie time! My favorite time of the year. 😉 And you have some good ones — thanks. I love no bake cookies. For me chocolate and coconut are a match made in heaven. I have so many events I have to bring food to. These are such a boon. All you had to say was chocolate and coconut and I’m there! hooray for the no-bake cookie! These cookies are a dream come true. Coconut, chocolate, AND no bake? I’m in love! those little toppers are so cute!!! Can’t blame “Santa” for loving these cookies either 😉 so tastyyyy! 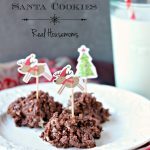 I love making no bake cookies, these look great for the holidays! Heading over to peak at the recipe! So simple and cute, perfect for Santa’s cookie plate! 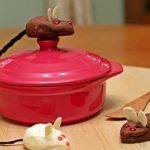 Looks delicious – and I love how easy they are to make, especially being so crazy busy this time of year! These look soo good! Love the coconut and chocolate! My Santa is going to gobble these up! I need to embrace this no bake cookie thing! Clearly a time saver and hello chocolate! 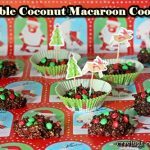 We always put out my mother-in-laws “famous” butter cookies for Santa, but I have a feeling that Santa would LOVE some of these no-bake macaroon! These look great! And the best part, no baking! I love easy baking recipes like these. I love macaroons! And you can never go wrong with extra chocolate. When you have a list a mile long of Christmas cookies to make, a no-bake option is essential! Delicious-looking cookies! It’s all about cookie time for me too! I wouldn’t mind a few of these coconut macaroon that’s for sure! These would never make it to the cookie sheet!!! YUM! 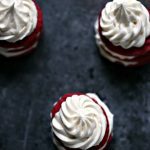 I’m all about the no-bake this year – time is flying by way too fast! These look perfect. 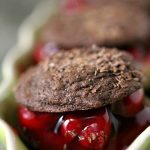 These kind of no-bake cookies are my favorite! Especially in the summer when turning on the oven just isn’t going to happen, especially since we don’t have AC over here. Oh yes, cookie time has definitively arrived also here in Portland. My girls are in cookie heaven and your no bake macaroons look fantastic! This is the first year Santa won’t be making a trip to our house and it is killing me (plus, let’s be real. It is much harder to hide presents when you know someone is looking for them instead of just thinking they appear by magic). But we will have to put out some cookies, for tradition’s sake. These must be the ones! They sound amazing! I am a coconut junkie. There. I said it. I love coconut. And I love chocolate. So these are ppretty much the bees knees. 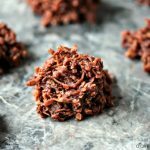 I love all things no bake! These look delicious! 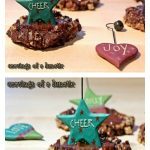 No bake, coconut and festive…. these are just about perfect! You had me at No Bake!! 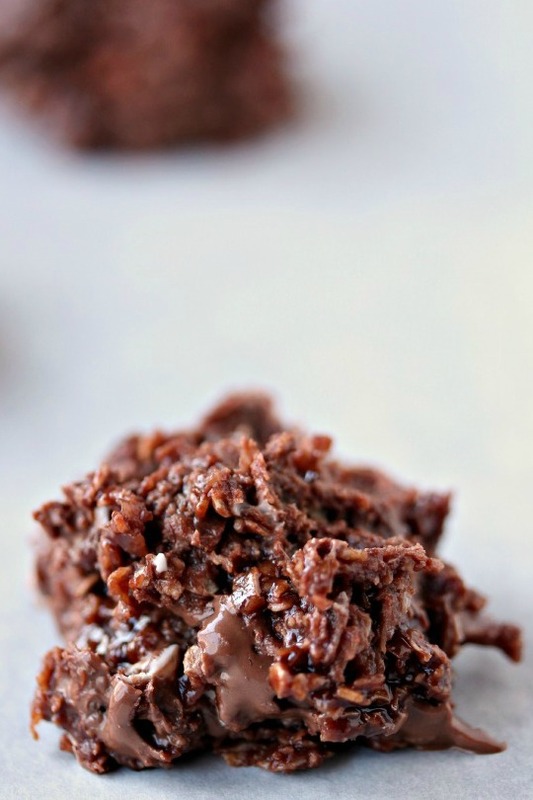 And cookie….and chocolate…..
Yeah, I’m all about some no-bake cookies right now. I’m tired of cranking up the oven every 3rd hour lol And I’m going to check out your pink macaroons too. I like that your cookies remind you of people in your life. (me too) I miss my Mom’s “care packages” of cookies, so your cookies remind me of those days. Awe, thanks Pat. I find food really does spark memories for me. I love making recipes that remind me of my childhood. Hope you had a great holiday season filled with LOTS of cookies.